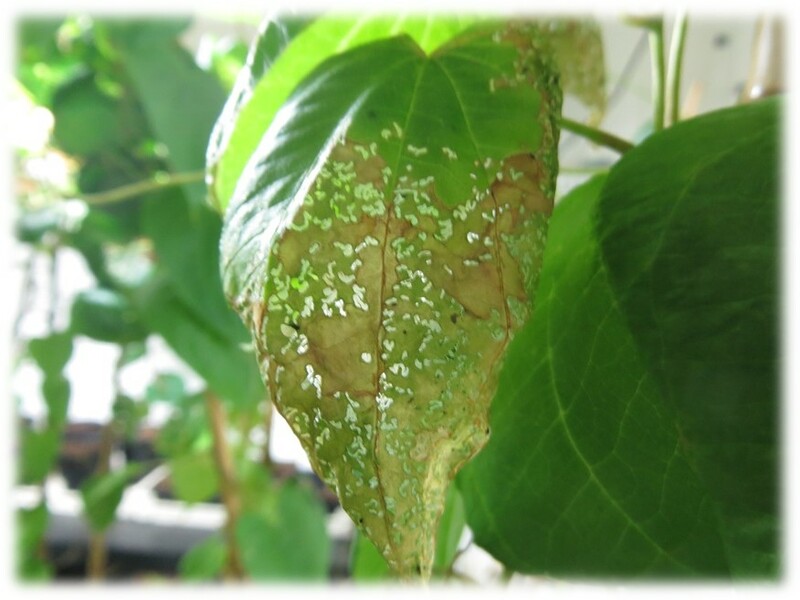 How can I tell if I have air potato beetles or not? 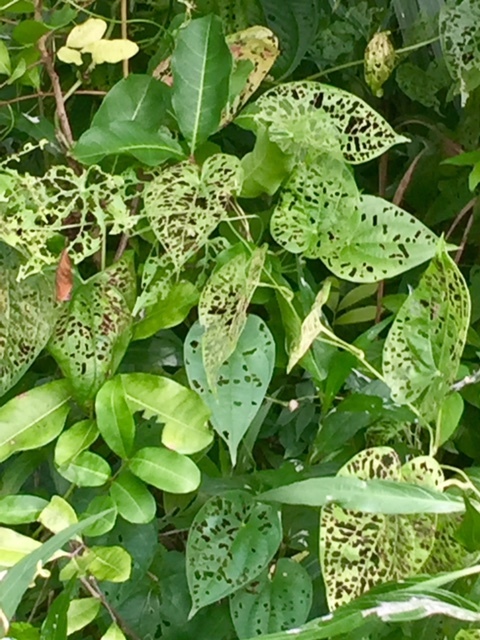 The leaves have tiny holes chewed into them from beetle larvae…..
Or you actually see beetles on the plants! I never saw any beetles emerge after the winter. Now that I’ve put out a new batch of beetles, I’m seeing some damage to the leaves — but not much. I also do not actually see any beetles. Perhaps they’ve gone to ground? If you just released beetles it takes some time for their population to increase. If you see damage then the beetles are working- it takes time before they become so numerous that you see the adults. Hopefully yours (or your neighbor’s) will return. They may be present but in very small numbers right now. We need to be patient. They took a while last year too. I saw very little evidence, and then all of a sudden they were everywhere and caught up with the a.p. vines. That can happen when your beetles return and reproduce in the spring, or if they fly into your patch from the surrounding area. Vines are coming back with very large leaves. air potato plants were dominating last summer. Its May 2018 and I have just noticed that the air potatoes have returned to many of the areas that were eaten by the beetles last year. The plants are young, and just beginning to wind up into the trees. Some of the leaves have holes in them but I don’t see any beetles. When the plants are pulled up we can see that some are growing from a very small bulbil and some from just roots. At what point should we get some more beetles? I believe you’re in Volusia County? 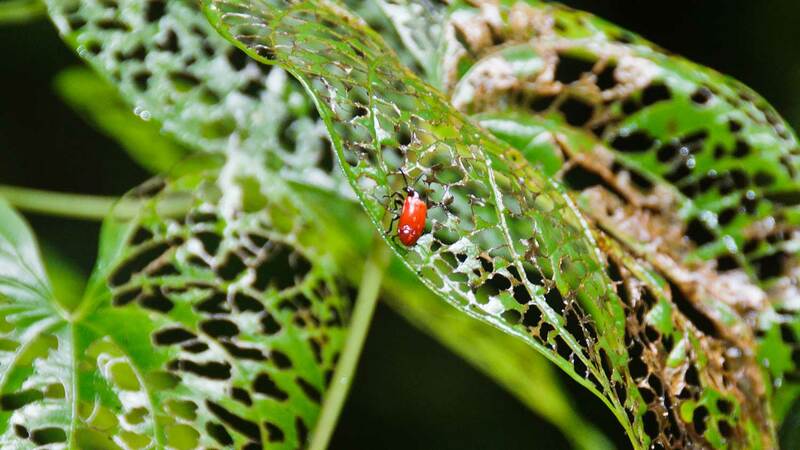 Watch for holes being chewed in new leaves- that would mean that you have beetles present. If you don’t see any evidence of beetle feeding in a few weeks you may want to order some. I will be adding the order form to the website in a day or two. Duval country here. Noticed a couple weeks ago that the vines have started to come back in a few areas. Not nearly as bad, but they’re there. At this point I don’t see any signs of beetle activity so I may need to get another batch of beetles. Had hoped they would have been able to overwinter but it may have gotten too cold for them.